grass stains: School projects don't bother me at all. Also, pigs fly. School projects don't bother me at all. Also, pigs fly. Weekend before last, I didn't bother making any kind of social plans. I knew the entire weekend would be devoted to craft projects for the boys. While I love crafting for fun, I do NOT like crafting for grades. Or, rather, SUPERVISING crafting for grades. Because I'm not one of those moms who does all the work and lets the child take credit. If you know me at all, you know how hard it is for me to release control and let the kids take the reins. BUT. I think it's completely obvious when the parent does all the work, and I don't want the kids to grow up thinking that's okay. Or thinking that I'm going to do all of their projects for them. How in the world can I do all of their projects and still keep up with my TV shows and my scrapbooking? Something's gotta give, Internet. Might as well be my children's education. So anyway. Nathaniel was assigned to build a 3D model of the Great Wall of China back in September. Yes. September. And it's a good thing I wrote it down in my planner way back then, because we didn't get so much as a piece of scrap paper with a reminder on it that it was due on Jan. 23. What is this, college? Nathaniel decided he wanted to build it out of styrofoam, so I purchased all the supplies and he went to town. The only thing I did for him was cut the styrofoam into roughly evenly sized blocks, because that had to be done with a knife and I didn't want him handling the knife. He laid a sheet of foam in the bottom of a box top, then stacked the blocks up using toothpicks to hold them together. Next, he painted the wall, then laid moss down in every nook and cranny to represent the forest. 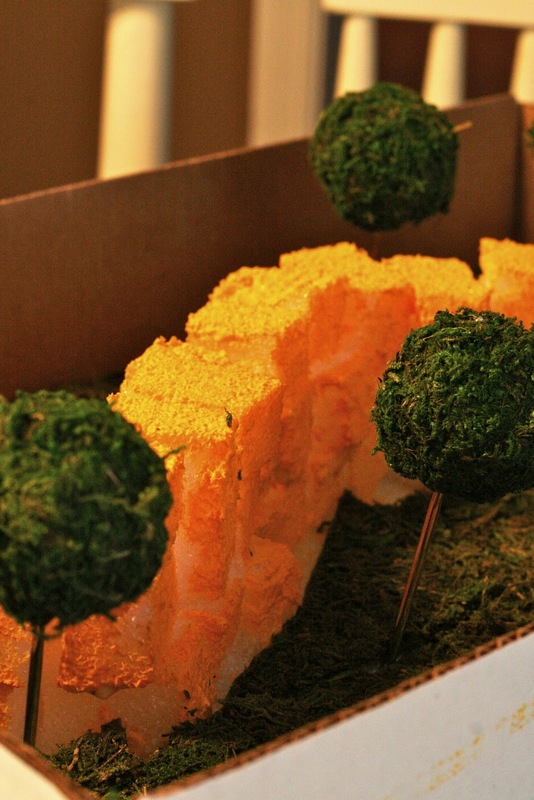 Last, he added the trees, which were moss balls he stuck on knitting needles. He was really proud of the finished product, which took about two hours from start to finish. Seemed like longer. The next project for the weekend was Nick's 100 Days project. He had to decide which 100 items he wanted to stick in a 20-ounce bottle, then come up with clues to help his classmates guess what the items were -- because the bottle would be in a paper bag. He chose tee-tiny alphabet pasta. It took almost as long to count and recount the miniscule pasta pieces and come up with his clues as it took Nathaniel to build the Great Wall. The final projects of the weekend were Nathaniel's and Nick's Pinewood Derby cars for Cub Scouts. There was a lot of painting, gluing and weight-adding to get them into racing shape. Grayson oversaw the building/painting/etc. for the racecars. And it paid off! 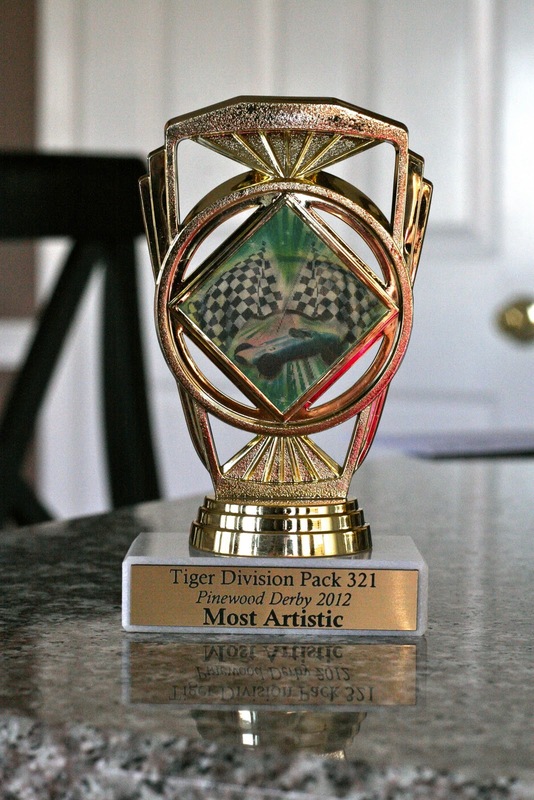 Nick took home Most Artistic in his division last weekend. I think he was as proud of that as he would have been if he'd won the race. I know I was. Nathaniel won a blue ribbon in his race, but no trophy. No worries ... he was fine with it. I hope we're done with crafts for a while. I'm spent. Those are all great! I think they did awesome jobs even without much help! Well, the projects turned out wonderfully, but I feel your pain about having to do them. I usually pawn off the project duty to Gordy since he prefers the Grand Assignment to the mundane daily homework. I, on the other hand, can not stand a school-inflicted craft project. It's a good thing our kids have Gordy! As a teacher, thank you, thank you, thank you(!) for not doing their work!!! Their projects look great and. They must feel proud of themselves!! I swear I think sometimes teachers send projects home to see how smart us parents are. I know when my daughter was in Elem School she brought home projects that she had NO IDEA how to do! They are definitely a lot of work.